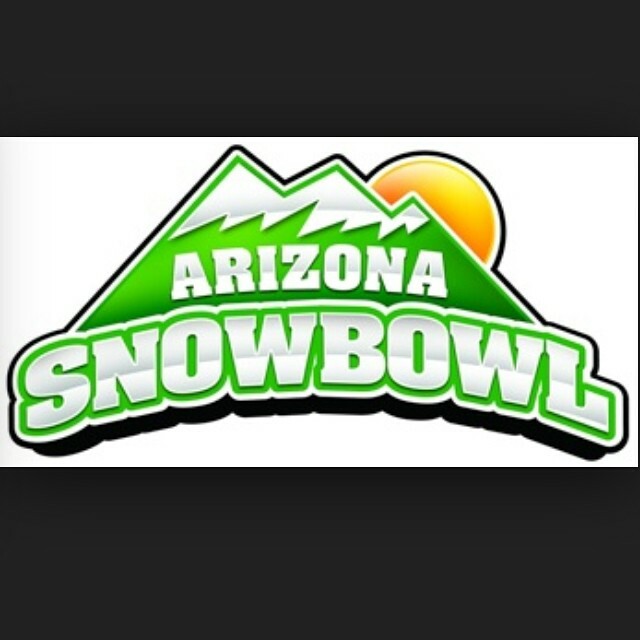 Arizona Snowbowl is ranked No. 141 in North America for its total snowfall during an average season. A mix of just enough snow and an abundance of sunshine have been luring people up the road from Flagstaff to ski in the thin air on the flanks of the San Francisco Peaks since 1938. That makes the Arizona Snowbowl not only one of the oldest continually operated ski areas in the country but also one of the more elevated—the lower of Snowbowl’s two lodges has a lofty elevation of 9,300 feet. The tallest point in this small range is close by at Humphries Peak (elev. 12,637 feet). So don’t be surprised if you feel a twinge of headache as you dismount the ski area’s highest chair lift, the Agassiz. It’s the 11,500-foot altitude talking to you. This old resort is in the midst of a promising transition. It started in 2012, when the Snowbowl won the right to begin supplementing its natural snowfall with the manmade stuff made from reclaimed runoff. The resort can now begin its early-season sessions around Thanksgiving, expanding to nearly a full open by late December and, with a little help from Mother Nature, stay open until early April. Then in 2015 came new ownership eager to modernize. James Coleman has installed two high-capacity chairlifts, including a high-speed six-person lift called the Grand Canyon Express. He has also significantly expanded the ski terrain. For now, Coleman hasn't opened up the ski area’s sexiest feature, its massive upper bowl. It remains the area's least accessible. This open expanse is infrequently covered with sufficient snow to accommodate skiers. Even when the snow is deep enough, the upper bowl is not served directly by a chairlift, which is, as always, good and bad. You’ll need to yank your skis off and walk 10 or 20 minutes upwards from the top of the Agassiz lift. But if the snow conditions are right—it happens every few years—the area can produce ski runs that are the stuff of dreams. And the fact that it’s hike-to terrain means it doesn’t get skied out too quickly. If you are a fan of back-country and side-country skiing, the Snowbowl is a worthy destination in years when snowfall goes past the annual 208-inch average. In more ordinary times, solid skiing can be found on the Snowbowl’s workaday runs, safely tucked into the forested acres below 11,500 feet. If you grew up skiing in the green hills of the chilly northeast, you’ll feel at home on the Snowbowl’s relatively narrow, groomed runs lined by tall evergreens. Most of the 40 runs here are set up to take maximum advantage of the tree shade. The trees prevent the snow on the runs from evaporating in the 40 to 50-degree air that envelopes this ski area on most afternoons. In more ordinary times, solid skiing can be found on the Snowbowl’s workaday runs, safely tucked into the forested acres below 11,500 feet. If you grew up skiing in the green hills of the chilly northeast, you’ll feel at home on the Snowbowl’s relatively narrow, groomed runs lined by tall evergreens. Most of the 40 runs here are set up to take maximum advantage of the tree shade. The trees prevent the snow on the runs from evaporating in the 40 to 50-degree air that envelopes this ski area on most winter afternoons. Beginner skiers should head for the area’s Heart Prairie and Aspen lifts. These are sluggish but kid-friendly two-person chairs that deposit skiers onto a broad, gentle slopes. There are also conveyors here for the little tykes. Most intermediate and expert skiers should head for the new high-speed Grand Canyon Express or to Humphries, a four-person chairlift. Experts can also head for the mountain's plodding Agassiz lift, which rises to 11,500 feet and serves the trickiest terrain. Some of the runs here are surprisingly long. Skiers fond of fast, giant-slalom style carving turns should head for Logjam, the broad, gently sloped groomer east of the Agassiz lift. Prefer a steeper groomer? Try skiing Lava. Mogul expert? White Lightning is your run. 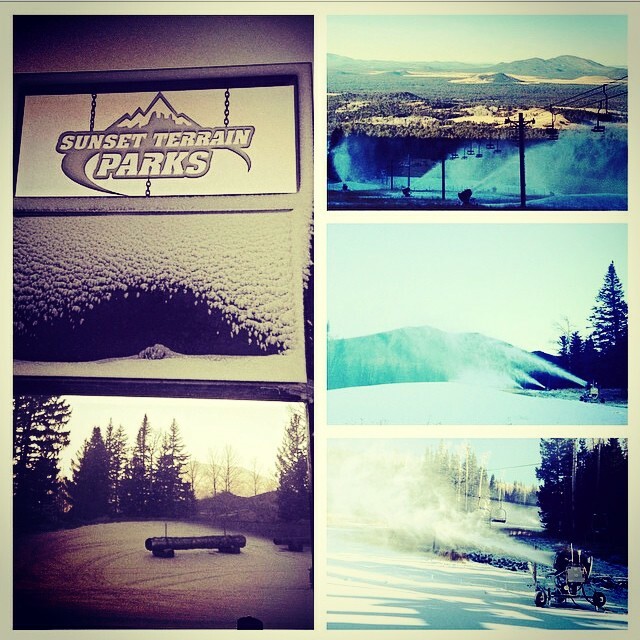 Fancy a terrain park? There’s no halfpipe here, unfortunately, but Coleman has taken pains to develop a respectable park that is served exclusively by the three-person Sunset chairlift. There’s another, slightly less elusive aspect of the Snowbowl that you should know about: tree skiing. Again, it takes an above-average snowfall, but the Snowbowl has some of the best tree skiing in the west. If conditions are right, head for the glades to either side of White Lightning. Despite the improvements, a trip to the Snowbowl still feels a bit like a throwback to earlier times. This is not by any means a modern ski “resort.” The area’s development, on 777 acres of U.S. Forest Service land, is still severely constrained. This is partly due to vigorous objections of local Native American tribes who consider these hills sacred. And it’s partly fact that most Phoenicians either don’t realize there’s some reasonably good skiing just two and a half hours north of their city or don’t care. The result, if you are a fan of slightly less developed mid-grade resorts like Maine’s Sugarloaf, is charming. Slopes here are only crowded on major holidays. The hillsides next to the runs are not dotted with condominiums. The beer and food prices are almost reasonable. A full-price single-day lift ticket here cost $75 in 2017 — well below the price of entry at more celebrated resorts. Of course, lack of development isn’t all good. The Snowbowl’s three primary lifts are underpowered, low-speed affairs. Local apologists say that’s a good thing, since the lifts deposit skiers on the slopes sparingly, giving each skier a chance to tear into his or her run without having to battle with a crowd. But long rides are boring, unless you’ve found a good sparring partner for 20 Questions. Most skiers would do well to drive the additional 10 minutes to downtown Flagstaff, a charming mountain town stuffed with good brewery pubs, college bars and affordable hotels running up to three stars. If you’ve got a few extra bucks and are looking for a comfortable, well-managed three-star hotel, try Little America, which is just a few minutes’ drive from downtown. If you prefer to be right in the middle of downtown and are a bit more pioneering when it comes to your accommodations, look at the Hotel Monte Vista. 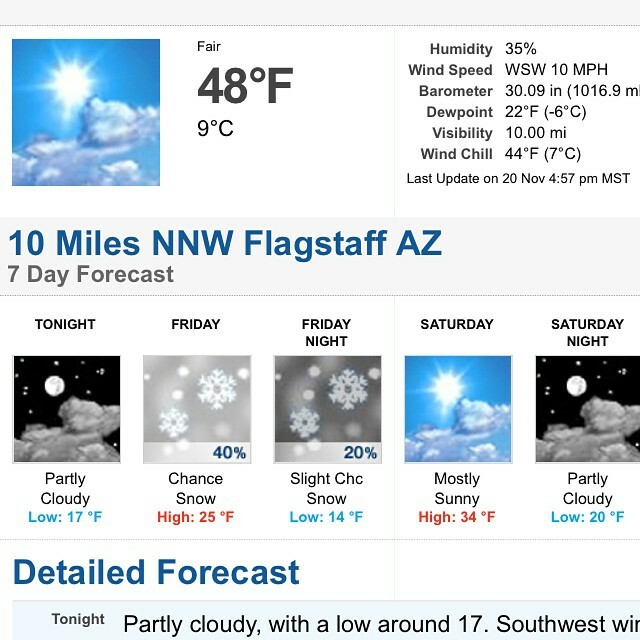 Arizona Snowbowl averages 204 inches of mid-mountain snowfall but with very high volatility ranging from less than 50 inches to more than 400 inches. Snow is medium in density and rain is rare with the 9,000 foot base elevation. Upper mountain bowl and tree skiing is very good in the big snow years. 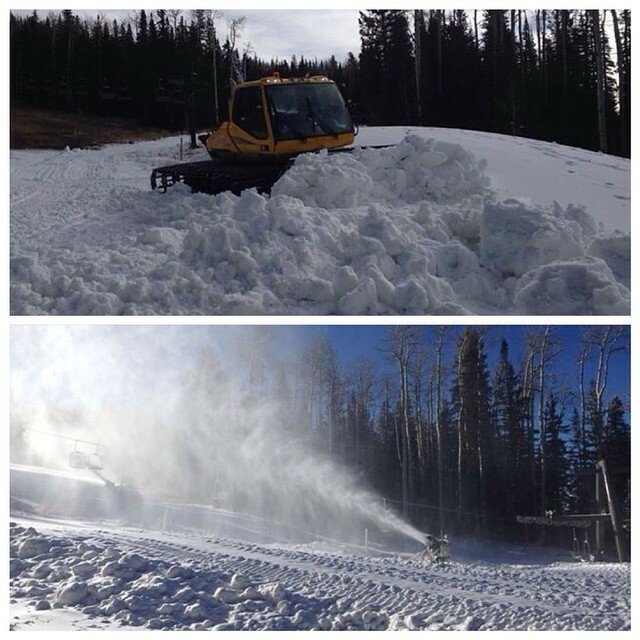 With its boom and bust snowfall there have been several seasons where Arizona Snowbowl has barely opened or opened well past Christmas. 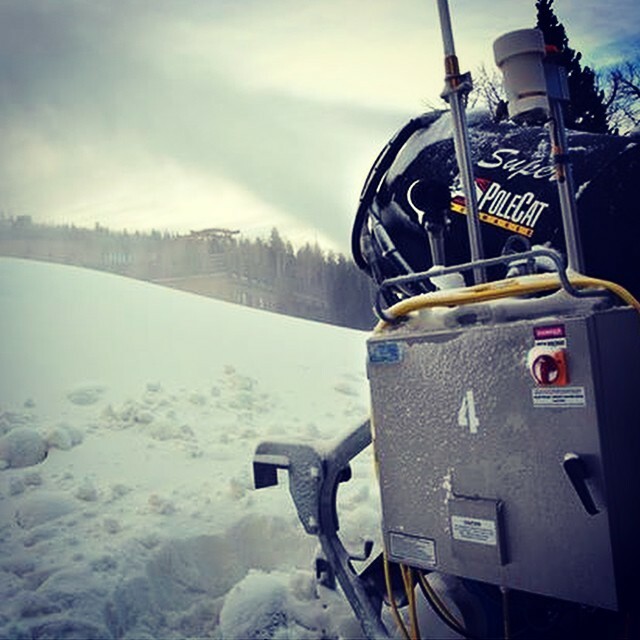 Snowbowl now has snowmaking to open some beginner and intermediate terrain in the early season. Primary exposure is west though 1/3 of the area faces north. Widespread melt/freeze conditions are likely in March with strong low latitude sun. 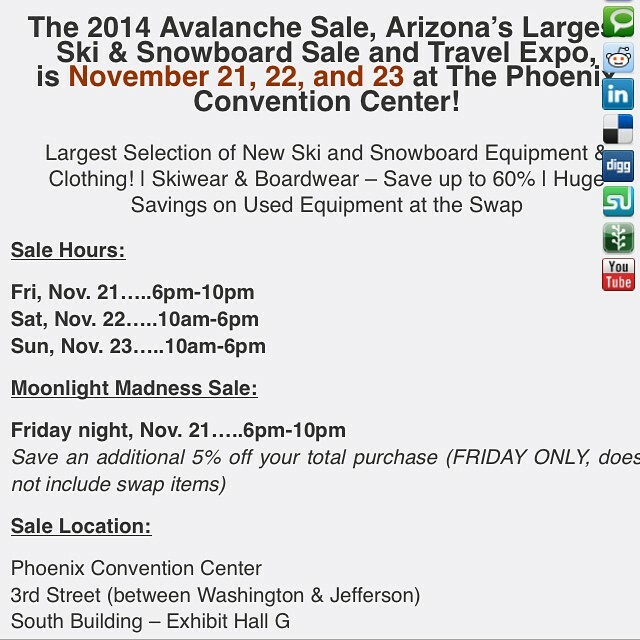 Arizona Snowbowl is generally most reliable in February and March with maximum coverage.